Date: 16 October 2013. Portlight Pretties. Stepping aboard many boats is often like entering a man cave, predominantly decorated in navy blue and off-white stripes, suitably nautical and totally boring. Just because it's a boat doesn't mean it must reek of every yacht motif created, and there's something to be said for creating a home that reflects the owner. Mine is girly for certain -- shocker there, eh? Still, there are ways to make your floating home nice that perhaps are just a touch different than the norm. 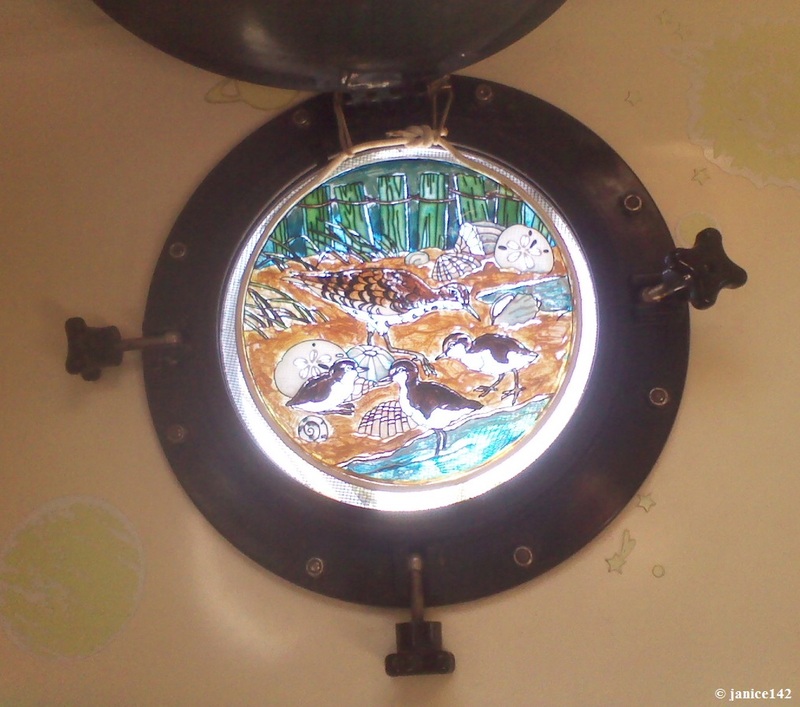 Side Note: A portlight differs from a porthole in that a porthole does not open. Portlights open. Weird, eh? Sometimes I think boat-talk is designed to confuse folks but then I remember that 8 ounce canning jars are called half-pints, and not cups so I feel a bit better. One problem I have is in taking my afternoon snooze, the sun shines in thru my portlights and bothers me. Yes, I realize this might not be a huge problem in the scale of things, but it did/does interfere with my happiness quotient, and that is a serious matter. To resolve same and let thru light plus some of the fresh breezes one comes to expect at anchor I bought a pair of sun-catchers that remedy both issues in one fell swoop. Now I will admit that there is a certain pleasure in seeing the sunlight reflected thru my pretties on the opposite bulkhead. Another bonus is they offer a degree of privacy. When I have been at a dock people naturally look into the boat. With the sun-catcher in the portlight folks see that, not beyond and into my cabin. One thing to be aware of with the less expensive sun-catchers is that they are not created from different pieces of colored glass. Instead they are painted. 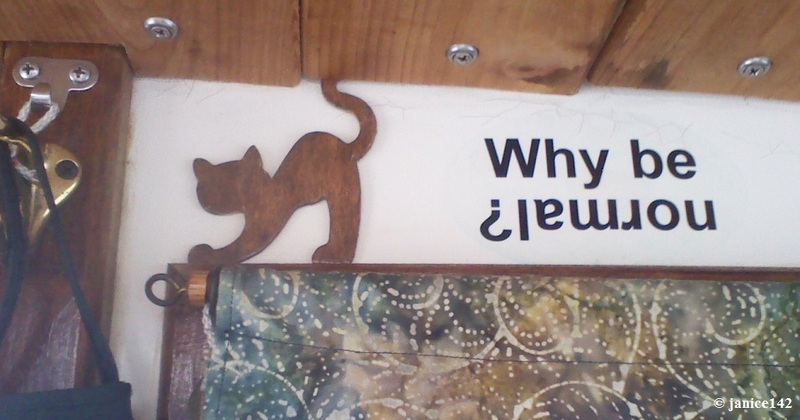 Thus, about once per year I pull out some of the cheap acrylic paint (think Walmart: $1 per plastic bottle) and fill in the blanks on the back side to brighten them.. The black edges are raised so it doesn't take a whole lot of talent or time to make 'em good enough again and that part is on the outside so no one can see if it's not perfect. Perfection is the enemy of good enough, and often good enough is fine and dandy! Besides, I think they are pretty as is. 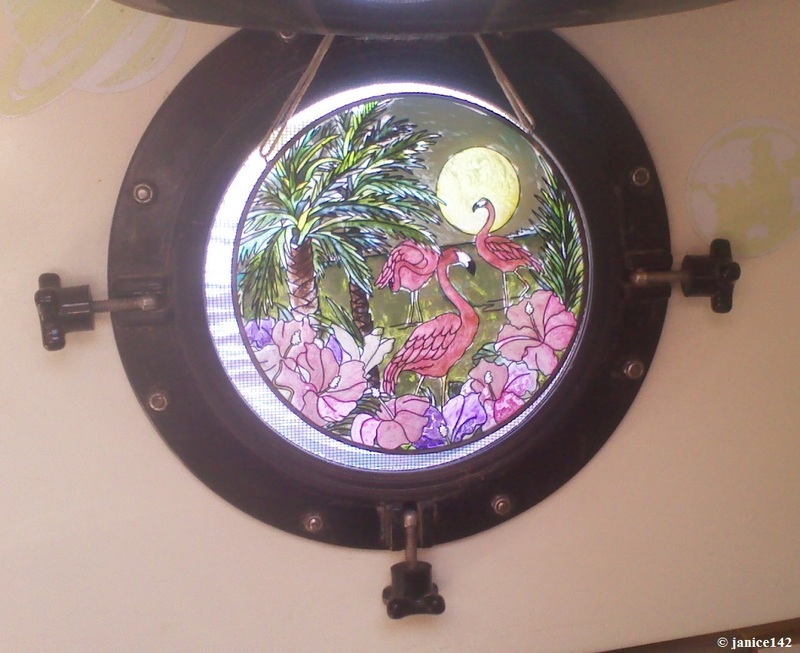 I have two more round portlights in the bow and will eventually buy sun-catchers to match -- though not the same. For me aboard Seaweed, I prefer to have items similar but not identical. That works well so that if something is broken or damaged I don't worry about getting an exact replacement. Something related is a-okay. Because I already have two water birds, perhaps an egret or blue heron is next, or maybe dolphins. I like dolphins too and even swam with one (bit me too, but that's another story for a future article some day) ... they are beautiful creatures and I do believe a dolphin sun-catcher would look well and suit Seaweed. Or perhaps a manatee would be lovely too. There are so many possibilities and the adventure will be in locating something spectacular. Part of the fun of owning your own home is in adding the touches that make her yours. 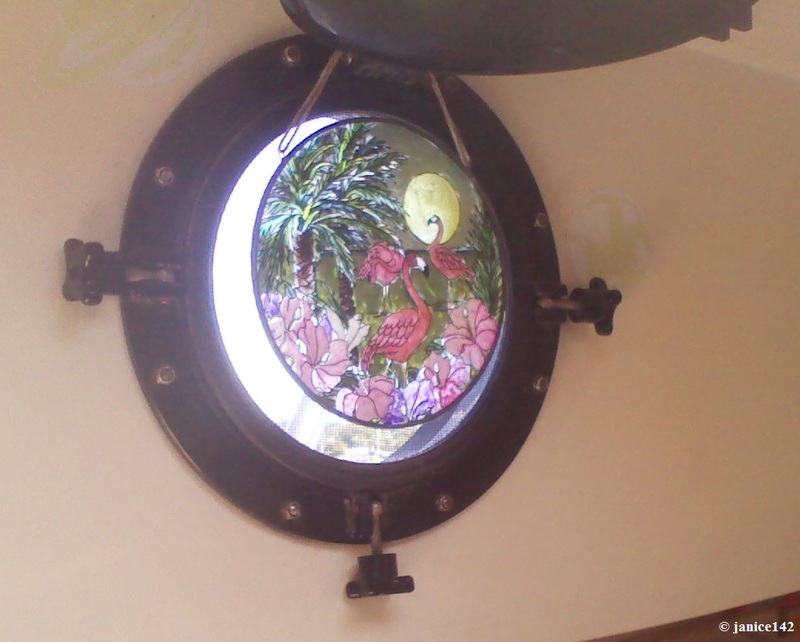 Just because it's a boat, doesn't mean it must be a bastion of nautical decorating. Addendum. November 2015. I've updated this article with a Better Solution. See the Portlight Privacy (at Carrabelle Riverfront Festival) article for details on what is new and improved. I've upgraded and am very pleased with the results. What do you use to keep the sun out? Where did you find your favorite boat pretty? A favorite aphorism: My uncle used to sleep in a chandelier; he was a light sleeper.